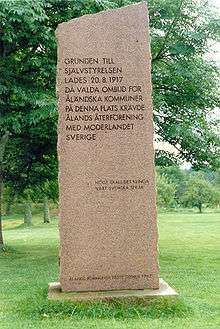 Commemorative stone of Åland's autonomy. The small text reads: Högt skall det klinga vårt svenska språk - Loudly shall it sound, our Swedish language. Åland Swedish Swedish: åländska is a dialect of Swedish spoken in the Åland Islands, an autonomous province of Finland. 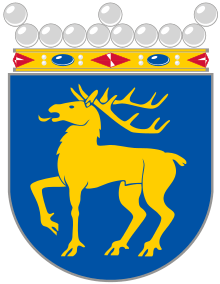 Åland Swedish has similarities to both Finland Swedish and the historical dialects of Uppland, but it is generally considered to be a variant of Eastern Swedish (östsvenska mål, varieties of Swedish spoken in Finland and Estonia). Swedish is the sole official language of Åland, and its status is protected in the självstyrelselag, a law that guarantees the islands' autonomy within Finland. As in Finland Swedish, the tonal word accent that distinguishes certain minimal pairs is not present in Åland Swedish. Of the two accents—the acute accent (accent 1) and the grave accent (accent 2) — only the acute exists in Åland Swedish. Thus [ˈandɛn] (the duck) and [ˈanˈdɛn] (the spirit) are both pronounced [ˈandɛn]. Certain expressions are typical of Åland Swedish. For example, the double genitive in Vemses flicka/pojke är du då? ("Whose's girl/boy are you?" (Vems flicka/pojke är du då in Standard Swedish)) carries the implication that the asker might know the parents of the person asked, likely in a small society such as Åland. Another characteristic is the substitution of inte (not) with inga (no, nobody, none; in Standard Swedish a plural form): Jag har inga varit där ("I have not been there"). A feature that Åland Swedish shares with Finland Swedish is the reduction of the words inte (not), skulle (should) and måste (must) to int, sku and måst respectively. The dialectal vocabulary of Åland Swedish is composed of words that are either characteristic of Eastern Swedish or have passed out of use (but are still understood) in the Swedish spoken in Sweden. Traces of Finnish, Russian and English can also be found in the dialect because of historical contact. batting n. (trä)regel batten batting in standard Swedish means baby. Probably from English batten. batteri n. (värme)element radiator batteri in standard Swedish means battery. byka v. tvätta (kläder) wash clothes From byk, laundry. Byk is archaic in Sweden ("cf." Finnish "pyykki"). egnahemshus n. villa (detached) house Archaic in Sweden. ämbar n. hink bucket Archaic in Sweden. Word borrowed from Low German, derived from Latin amphora. ↑ Självstyrelselag för Åland 16.8.1991/1144 - 36 §. Retrieved 10 Apr. 2009. 1 2 3 4 Åländska ord och uttryck. Bibliotek.ax. Retrieved 10 Apr. 2009. Andersson, Sven. Notlage, notlösare och notgår: ordens betydelse i åländska folkmål. Part of Skrifter utgivna av Historiska samfundet i Åbo. 1954. pp. 18–30. Ramsdahl, Carl. Ryska lånord i åländskan. 1976. Sundberg, Eva. Dialekten i Ålands nordöstra skärgård. Mariehamn 1993. Svenblad, Ralf. Med åländska ord. Mariehamn 1996. Willandt, August. Åländskt bygdemål. 1919.